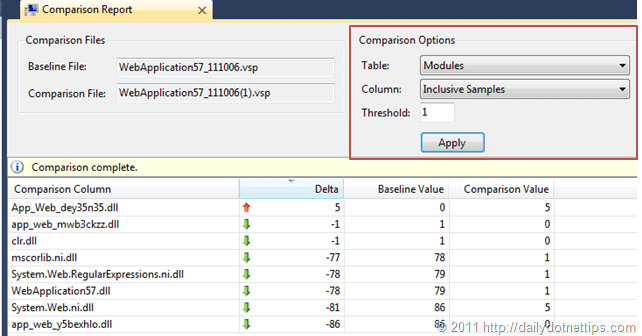 You can compare the results of two different profiler performance report files (.vsp ). Reports folder in performance explorer contains all the list of reports that generated so far from the current performance session. You can select two different reports to compare them. The difference between two reports presents a table view . The table shows the change from the baseline and the current session. First Right clicks on the reports in Performance Explorer and select “Compare Performance Reports” from the context menu. The report ( .vsp) file which is being select first will be consider as Baseline. Select “Compare Performance Reports”, it will launch file selection dialog where you have to specify the another filer on which you want to do the comparison. Browse the “Comparison File” and click on “Ok” . This will generates the “Comparison Reports” on a Table View . 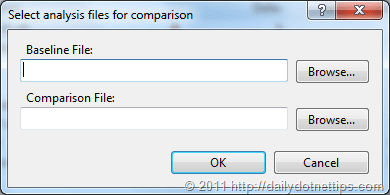 Comparison reports will display the Baseline value ( result from Baseline File) and the Comparison value ( result from Comparison File ) and a delta between these two. This will help you to understand the optimization impact between two different performance reports. By default, comparison reports shows the result based on functions. You can change the option from “Comparison Options Section”. You must have to Apply the setting after changing the value. You can also provide some threshold values to filter out few data. 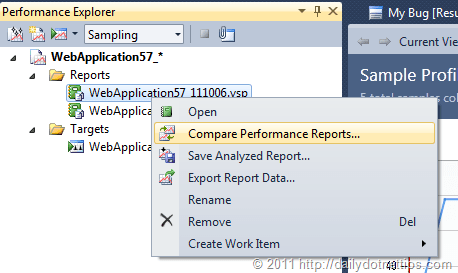 You can also launch this performance reports from Analyze > Compare Performance Reports Menu. 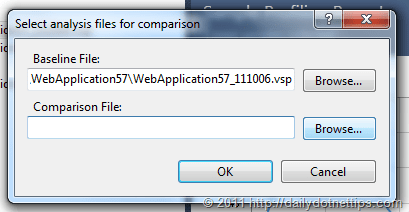 Where you can specify the both baseline and comparison performance file. This is useful, when you just want to compare two existing reports .